Looking for a torch that is easy and safe to handle but also make you look like a Pro? ADJUSTABLE TEMPERATURE CONTROL that gives you the power of choosing the flame sizes.< SAFETY LOCK that gives you the certainty that it will only ignite only when its enable, so you don't have to worry at all. FLAME LOCK that lets the user have a continuous flame without needing to hold the ignition button all the time, giving the user more control and worry free time. TANK CAN LAST UP TO 60 MINUTES We know you want the most usage possible. ADJUSTABLE POTENCY HANDLEthat gives the user a STRONG POWERFULL FLAMEto complete soldering activities, plumbing, jewelry, arts and craft or why not? Preparing a creme brulee! SMOOTH FLAME used to light up a candle, cigar, etc. It's important to keep away this product from children; it's a toy made for grownups only. Two years of warranty covers any fabrication defects. These torches are going fast at this price! Add to your cart now and have your Heavy Duty Micro Blow Torch complement your Tool repertoire in a matter of days! ✔ PROFESSIONAL AND AMATEUR FRIENDLY This high quality lightweight and portable torch can give the results that a true professional and apprentice requires, but it's so comfortable and easy to manage that an amateur user can handle it without a problem. Start becoming a true professional. ✔ HAND CRAFT ACTIVITIES+FREE EBOOK. Soldering, plumbing, arts and craft, awesome dishes, starting coal, outdoors, camping, possibilities are endless once you start exploring! Be amazed by the heat and power that the torch puts out for your activities. It's time to enjoy creating durable and strong pieces of masterwork and have a stunning time while doing it! PLUS WE INCLUDE A FREE EBOOK WITH AWESOME KITCHEN TIPS. ✔ SAFETY AND AWESOME FEATURES include: an extra-long nozzle for its powerful flame, adjustable temperature control, safety lock, flame lock, adjustable potency handle, removable stand and full tank can last up to 60 minutes!!! This torch can be your brand new toy(only for adults). All these amazing features concentrated in one powerful torch and the best thing, at the palm of your hand. ✔ BUILT TO LAST GUARANTEED! We have a lot of customers that love this torch so much that we are sure you are going to love it. 2 Year guarantee, "no questions asked" policy for the first 30 days with a money back/replacement guarantee and impeccable customer service that will work around the clock to keep you satisfied. (Shipped without gas for safety). ✔ EASY AND COMFORTABLE TO USE-Want to make your activities awesome? 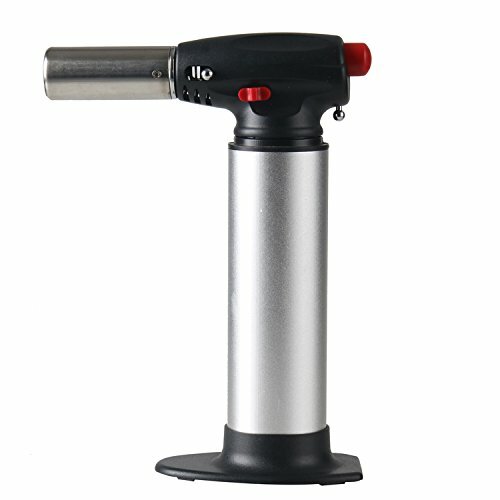 Its smooth design makes the torch very comfortable to use, and with flame lock the user can have a continuous flame without needing to be holding the ignition button all the time, giving the user more control and worry free time, its handy design is made to help hard working shores become more easy, go ahead and test it by yourself and prepare to be impressed. The valve will help to adjust the flame to suit every task you need. If you have any questions about this product by Inter Forte, contact us by completing and submitting the form below. If you are looking for a specif part number, please include it with your message.